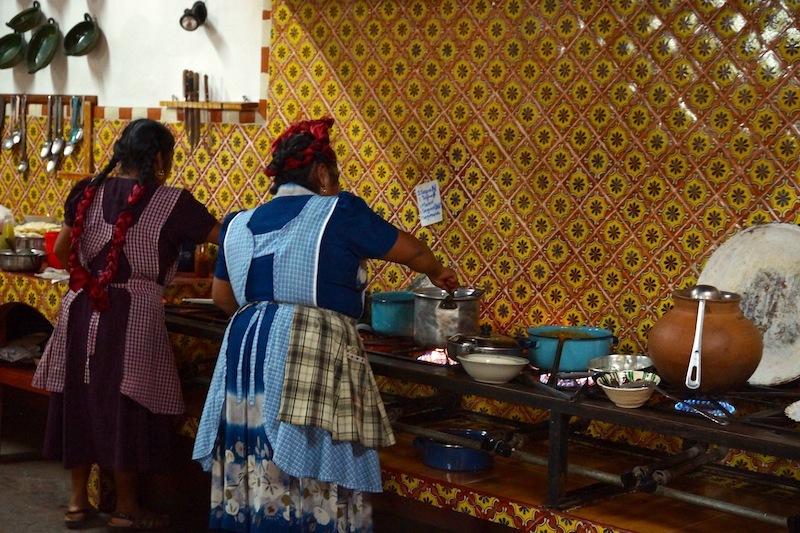 The Tlamanalli restaurant is located in Teotitlán del Valle, a Central Valleys region pueblo (village) in the State of Oaxaca. Teotitlán del Valle was part of the Zapotec Pre-Columbian civilization that flourished in the Valley of Oaxaca at least 2.500 years ago. 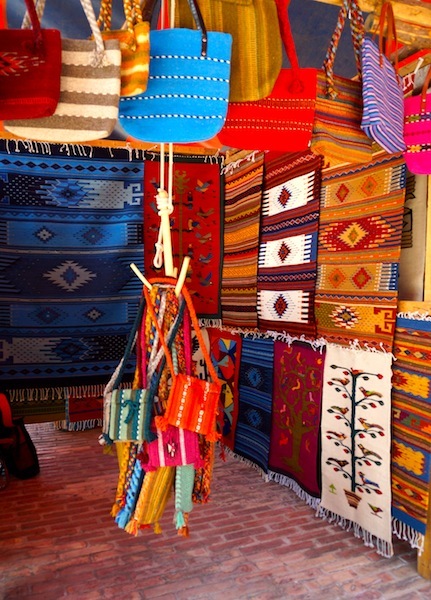 This pueblo or village is known for the woolen hand woven rugs, produced with natural dyes. 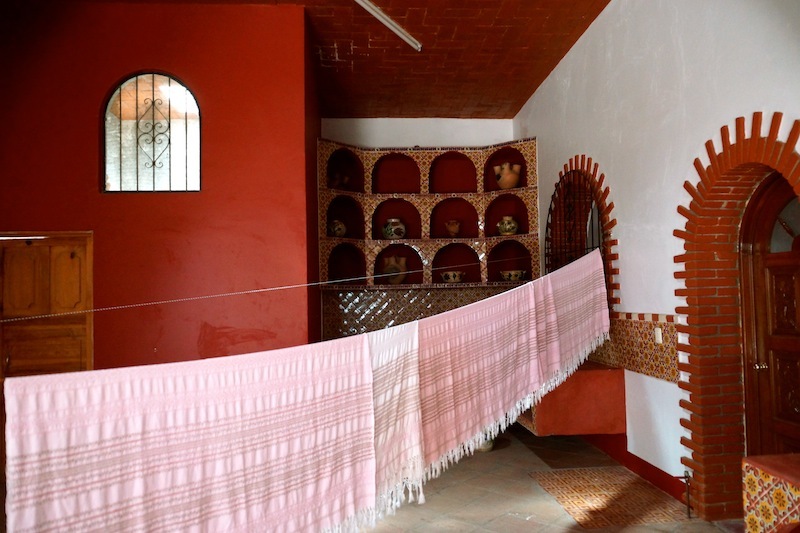 It is a textile tradition that has existed for many centuries, first with cotton and then during the colonial era with the introduction of wool by the Spaniards. It is a laborious craft as each carpet can take weeks or months to finish. All is done by hand in wooden looms and just like centuries before, all colours come from nature. 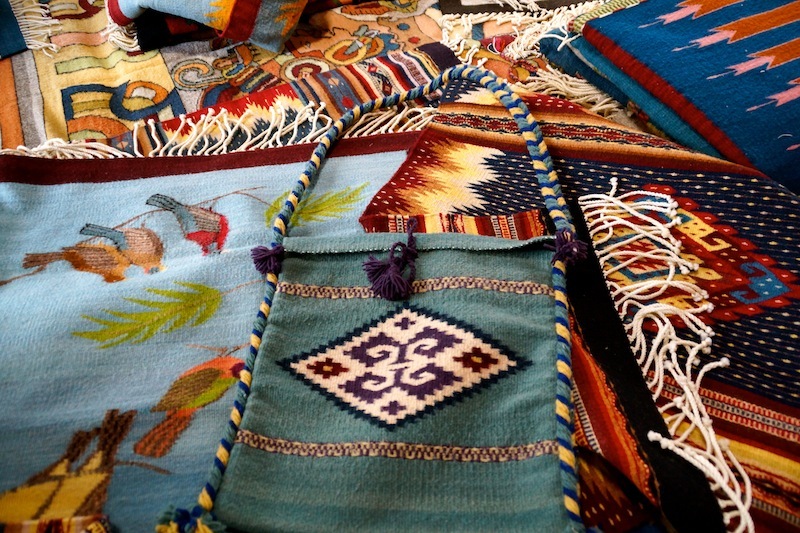 Marigolds give the carpets a vivid yellow color, the Indigo plant a vibrant blue, the Mesquite plant the black, the pomegranate the beige and the cochineal, the insect parasite that lives off cactus, the red. 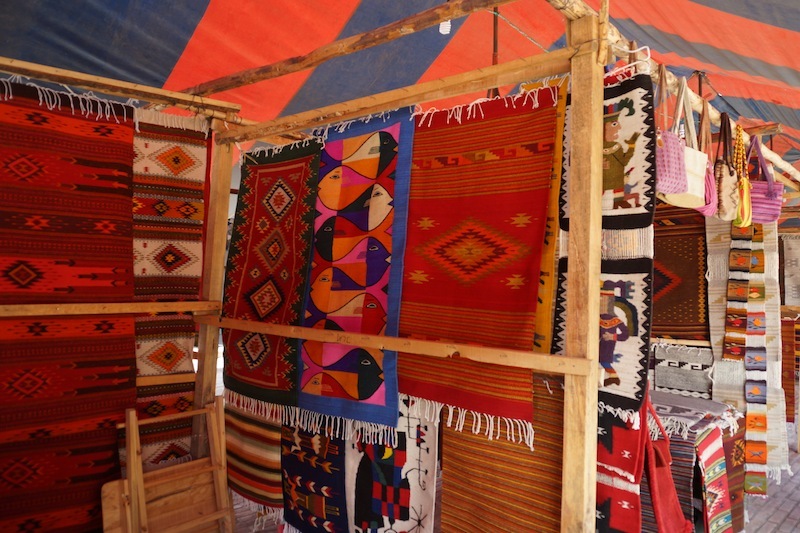 Usually you can find this wonderful work at the Handicraft’s Market at the heart of the village but when we arrived on a saturday, there was a fair outside. The prices are a bit high but the originality of the patterns and the quality of the wool make it worthwhile. 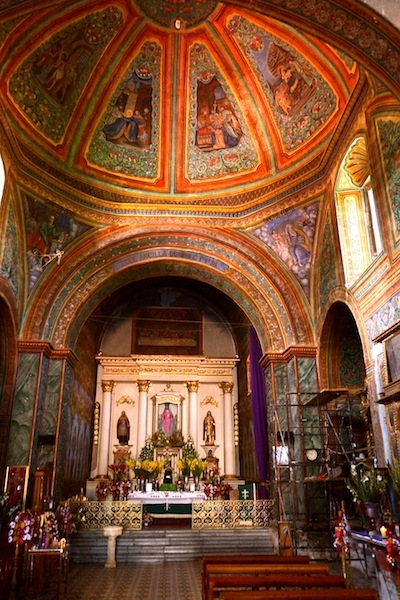 Nearby, is worth a visit the Iglesia de la Preciosa Sangre de Cristo, a precious church from the 17th century. Stones from Pre-Hispanic monuments were used in its construction as you can see by the reliefs shown in the facade. 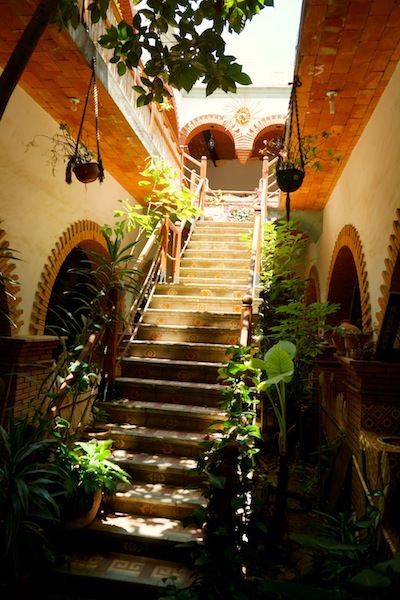 To have a taste of the real regional Zapotec food, you must visit the Tlamanalli restaurant, situated a few streets away. It was founded by the Mendoza sisters in 1990. Their culinary expertise is centuries old, passed from generation to generation orally and respecting the traditional methods of the past. 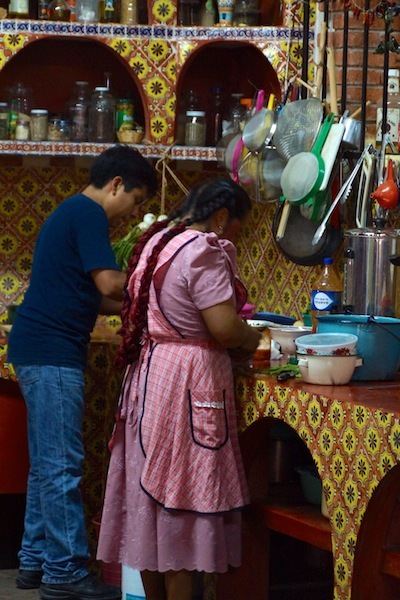 The more famous sister is Abigail who has participated in numerous national and international gastronomic festivals representing the gastronomy of Oaxaca. She has also been mentioned in the New York Times, Saveur Magazine and other media sources. As the Tlamanalli restaurant is only open 4 hours, from 1 pm to 4 pm, my advice would be to arrive as early as you can to fully appreciate it and savour the food. All is done fresh before your eyes so it takes time but it is entirely worth the wait. Ideally, you should book a table as the restaurant is not very big but we luckily managed to secure a table regardless. There is always a menu of the day, since it depends on what is fresh and in season. 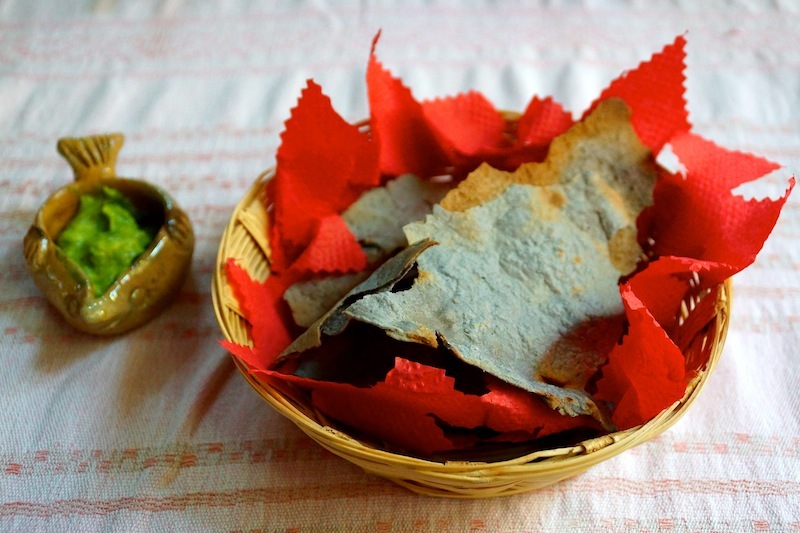 You are welcomed by one or both sisters and this is what you start with, wonderful blue tortillas with guacamole. 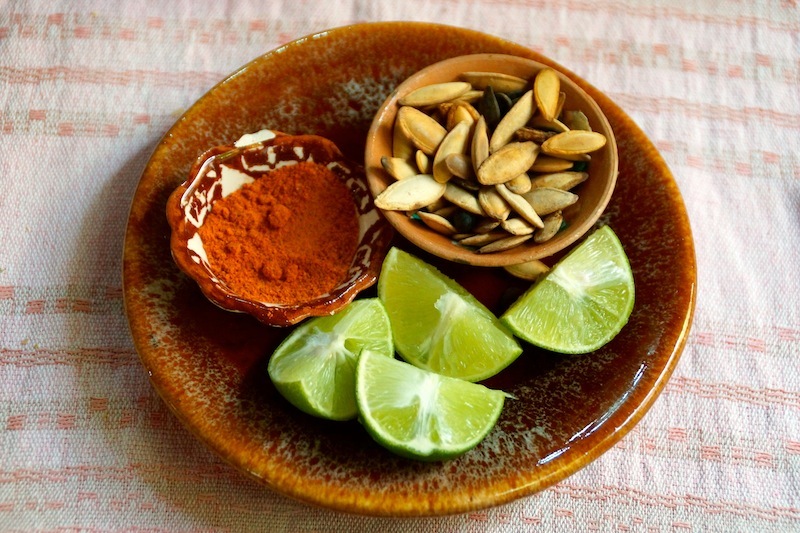 Pumpkins seeds with chile and lime on the side. 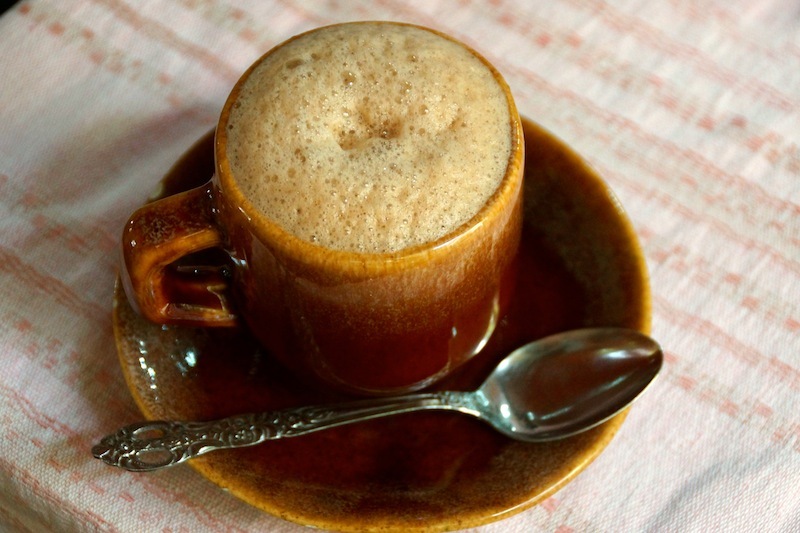 To drink we chose their famous hot chocolate, unfortunately we couldn’t have the delicious “atole” of chocolate, a pre-hispanic drink made with a special flour, corn, cinnamon sticks and chocolate. For that you need to warn them a day in advance as it takes longer to cook. 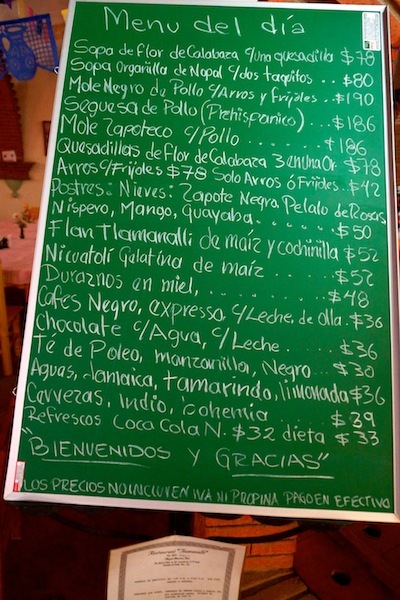 As I said before, everything in the Tlamanalli restaurant is done by hand, the chocolate was delicious and foamy. As you are waiting for the food you can watch the sisters and their family cooking in their traditional regional kitchen. 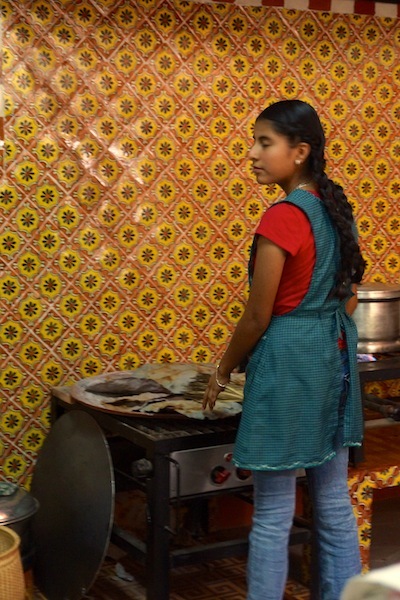 It is nice to see how the younger generation is already following in their footsteps and will no doubt continue to preserve and safeguard the Zapotec culinary traditions. 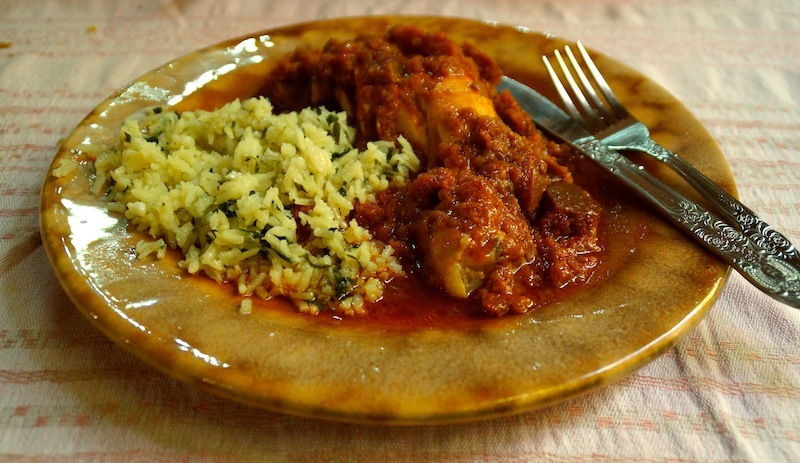 As main courses, we were advised to take the “seguesa de pollo”, a pre-hispanic dish. 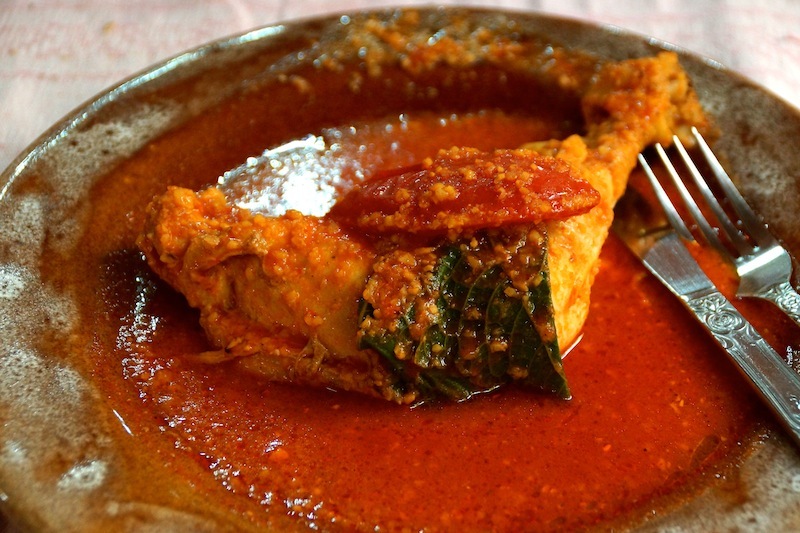 It consists of a chicken leg lying in a rustic corn sauce with the tomato complementing its rich flavour and the “Hoja Santa” (piper auritum an aromatic herb) giving it a special perfume. The chicken cooked at the restaurant is organic, they get fed tortillas, corn and alfalfa. You can certainly taste the difference in flavour and in the tenderness of their meat. Both dishes came accompanied by wonderful corn tortillas. 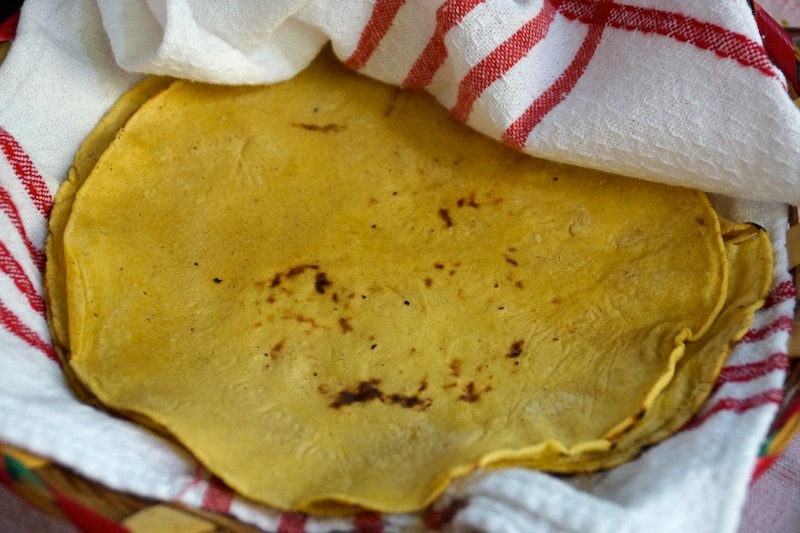 I have eaten a lot of tortillas in Mexico and these were among the best. 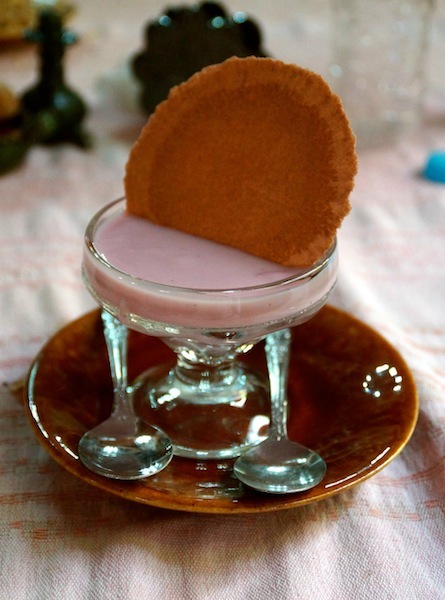 As dessert we chose the Tlamanalli flan of the house, a corn flan with cochineal powder. A very unique dessert that we loved. 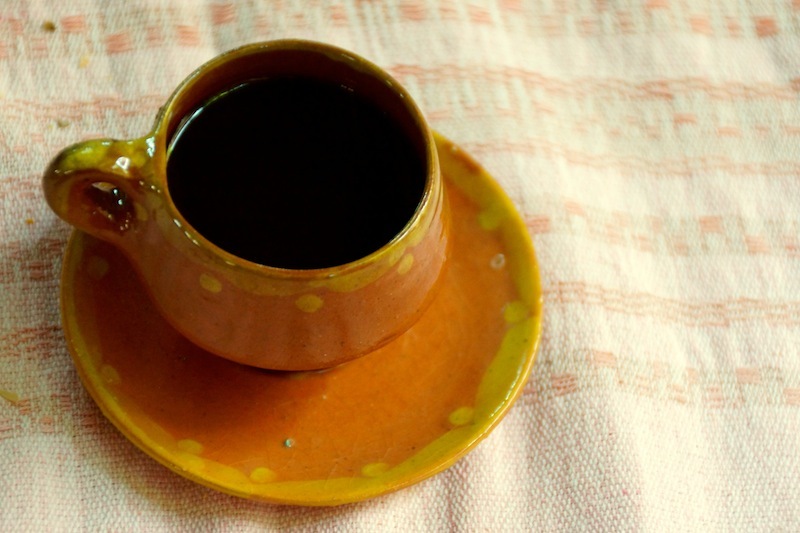 I had to finish with a “cafe de olla”, a typical regional coffee. There is also a shop selling the family handicrafts. The limited inventory is due to items being hand made. Only when they have a break from the restaurant can they dedicate themselves to weaving. 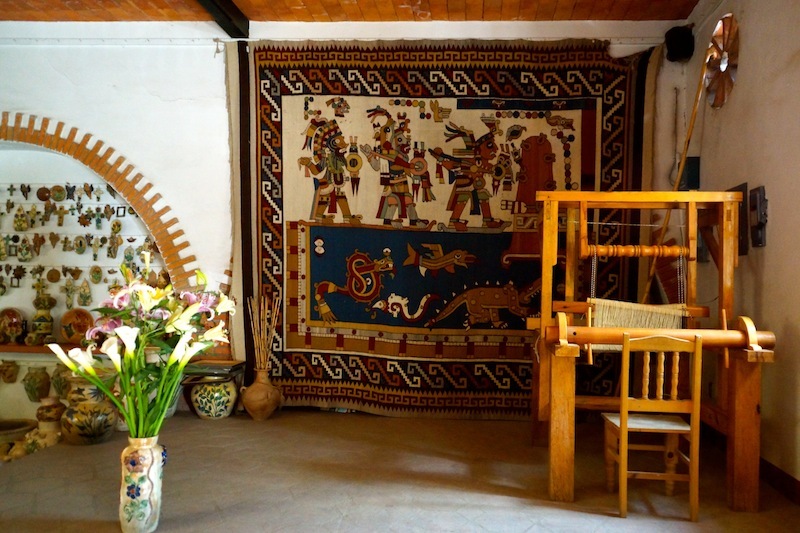 You can see here a typical wooden loom used in the production of the woolen rugs. And some examples of their beautiful work. 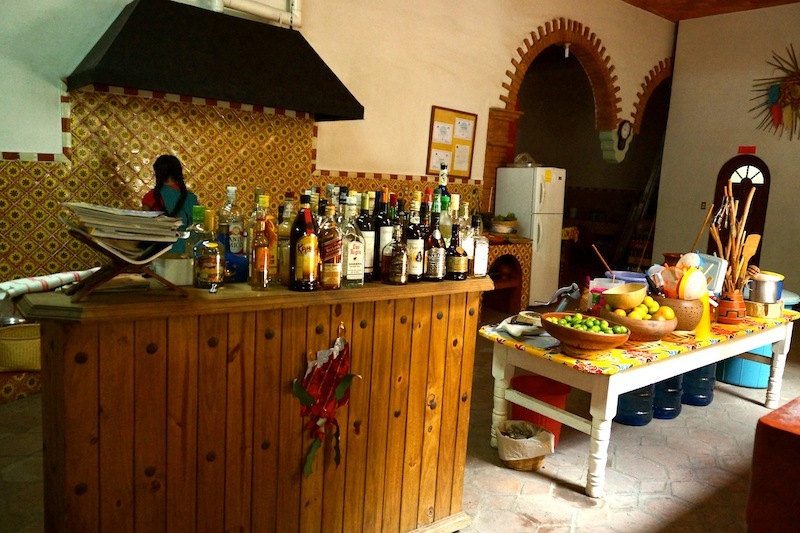 The Tlamanalli restaurant is really a very special place, one I strongly recommend if you want to taste real Zapotec and pre-hispanic traditional dishes. 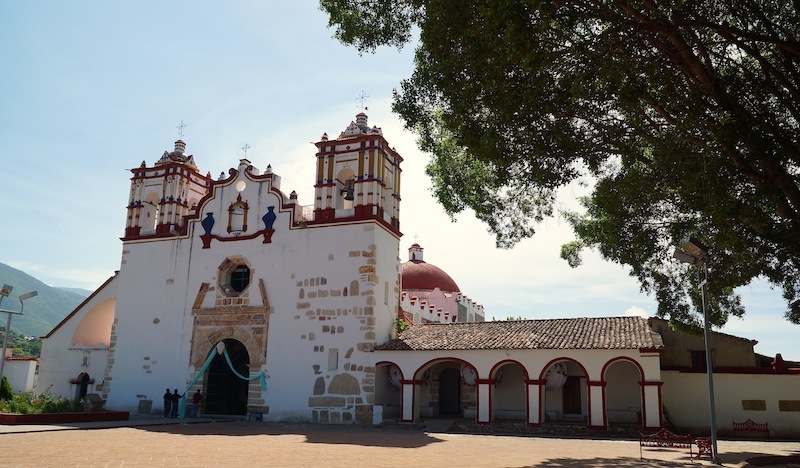 Teotitlán del Valle is worth a visit and is only 25 minutes away from Oaxaca. Maria: You are really a good writer, I do not know which one of your articles about Oaxaca I prefer. Thank you to let people know my country with foreign eyes. Thank you so much Carmen, I’m glad you have enjoyed my posts on Oaxaca. It is a wonderful state and there is so much to explore and discover. I was here in 2005 with a group from the Cultural Institute of Oaxaca with our Zapotec teacher, Tony or Antonio Mendoza. I am curious if he is the brother of these lovely ladies? And, is he still teaching st the Institute? Hello Rachel, I am afraid I wouldn’t be able to answer your question. I only met the sisters and we never talked about other family members. I was visiting Oaxaca but I live in Mexico City so it is a bit difficult to get you that information, sorry.